Breaking out of a glass tank, Venom is at full power! Limited edition 12-inch tall statue sculpted by Alejandro Pereira. Comes in a full-color window box with a certificate of authenticity. Venom is back, and Diamond Select is celebrating his rebirth with this approximately 12-inch tall resin statue of the original symbiote. Breaking out of a glass tank, Venom is at full power! Sculpted by Alejandro Pereira and limited to 3,000 pieces, he comes packaged in a full-color window box with a certificate of authenticity. 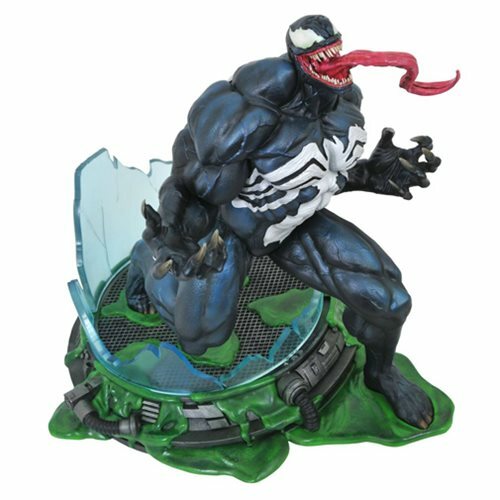 This Marvel Premier Collection Venom Statue is a must for any Venom fan! Ages 14 and up.